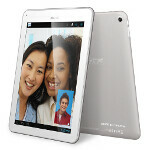 Lately, we've seen a parade of new 7 inch Android tablets hitting the market or preparing to do so. Earlier today, we told you that the Samsung Galaxy Note 7 was tested on the GLBenchmark site and will probably be introduced at next month's CES 2013 or the following month's MWC 2013. With all of these new 7 inchers, it's nice to see a new full-sized tablet get introduced. And that is what happened with the introduction of the Archos 97 Titanium HD. A new website devoted to the tablet has gone live, and according to the specs, the tablet will have a 9.7 inch IPS display with resolution of 2048 x 1536. This matches the panel on the third and fourth-generation Apple iPad and offers a 264ppi pixel density. A dual-core 1.6GHz processor is under the hood and 1GB of RAM is on board. The camera on back is 5MP and the one on front is 2MP. There is only 8GB of native storage on board, but that can be bumped up big time with the 64GB capacity microSD slot. Android 4.1 is installed out of the box. It sounds like competition for the Apple iPhone, although we have no word yet on pricing or availability. What might get some interested in the Archos 97 Titamium HD is that it is apparently running stock Android. He's referring to Apple's "rectangle with rounded corners" patent. Yeah he is, but some are too far away from normal conversation. Can't see this one released without a lawsuit. That because these days it's difficult to see any phone or tablet released without a lawsuit. 399 and they might have a buyer.. is it me or does this scream ipad wanna be? Why? If the next iPhone has a 720p display is an android want to be? Displays in electrics are alot like TVs. You aren't imitating someone because you have the same amount of pixels. I agree with you, and don't get me wrong, its just like it stole its whole concept from apple, which isn't necessarily a bad thing. I have always wanted an ipad with android os and a micro sd. But PA, what made you decide against having the option to "view pictures on one page"? Anyway, this tab looks nice! Anything that looks like an ipad the looks nice. Why is the front facing camera off to the far left? Just looks out of place. I guess they decided that it would be a more effective placement to share between the two orientations although that just seems off to me. Ya when using on the front facing camera. U need to put yr tablet aside lol. Yes, it is similar to the iPad (on almost every conceivable level), but given the fact that Archos is not a threat to Apple's well-being and sales, they likely won't pursue action against them. Put the right price on it, however, and it could be a sleeper hit next year. I'd pick this any day over an Apple product, no doubt. The specs are at least decent, so it will gain interest over time. In every conceivable way, you mean color, screen size, resolution and pixel density? That really isn't that much of a similarity. That's why I said "on ALMOST every conceivable level". It's impossible to not draw a parallel between this and the iPad, but it's not a straight carbon-copy. For example, it runs a different OS and you can expand the storage capacity. Aside from that, it's looks identical to an iPad. Okay, forgive me for the choice of words, then. You should be able to understand what I mean, though. Of all the similar devices out there, this has to be the closest thing to the iPad in terms of design. "It sounds like competition for the Apple iPhone" Shouldn't it be Apple iPad? I really doubt a 9,7" tablet will compete with a 4" phone.